Advanced Specialty Gases is the one company that solved the purity issue of R236fa with regard to Highly Volatile Unsaturated Impurities, also known as - “Unsaturates”. In July of 2011, ASG had successfully provided to the government re-purified R236fa, under independent lab testing, and compliant to DLA requirements, and to the standards of the American Heating and Refrigeration Institute (AHRI-700). For many years the specification for this single impurity (Unsaturates) was not clearly understood, the purity was not commercially available anywhere in the world, and it needed this secondary re-processing step discovered by Advanced Specialty Gases. This solved many years of non-compliant gas being sold into industry and the government. There are now a couple of other companies that have been able to secure the use of our third party processing facility in order to comply, but Advanced Specialty Gases is still the only company that fully carries out all the steps of the “Origin Inspection” requirements and the rigorous double and sometimes triple sampling of gas and signed off by an inspector prior to its shipment. ASG is now the principle supplier for R236fa to DLA, and is the only R236fa that undergoes the complete process that ASG and DLA co-developed in order to guarantee purity and conformance on every cylinder. We thank you for placing your trust in Advanced Specialty Gases. 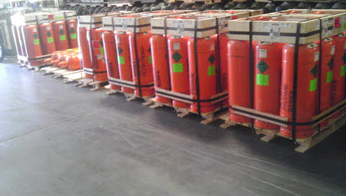 Advanced Specialty Gases of course complies with all of the MIL-SPEC Packaging Requirements and is firmly committed to giving you the finest R236fa product, fully compliant and usually freshly refurbished cylinders, and all presented in the best packaging in the industry.